Steve Daines is a US Senator from Montana. 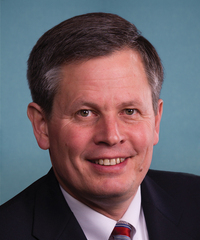 Daines was first elected to that office in 2015. Prior to that, he was Montana’s at-large Congressman. Daines supports the Trump Administration’s national monument review. He opposes the transfer of federal public land to states and has criticized cuts to the Land and Water Conservation Fund (LWCF). Senator Daines supports revising the Obama-era sage grouse plans. He opposes the methane rule. Steve Daines signed a letter commending Donald Trump’s executive order to review and shrink national monuments. Steve Daines “strongly oppose(d)” the transfer of federal public land to states. Steve Daines criticized cuts to the Land and Water Conservation Fund (LWCF) in Donald Trump’s budget. Steve Daines was hopeful about Ryan Zinke’s secretarial order to revise sage grouse management plans.